A tub shield is a great way to feel less confined in your showering space as it provides an open area at all times while still keeping the water inch The pivoting glass panel, both inwards and outwards, makes it easy to get in and out as well as to access the faucets and clean your shower. It is also a great solution for slanted ceilings. 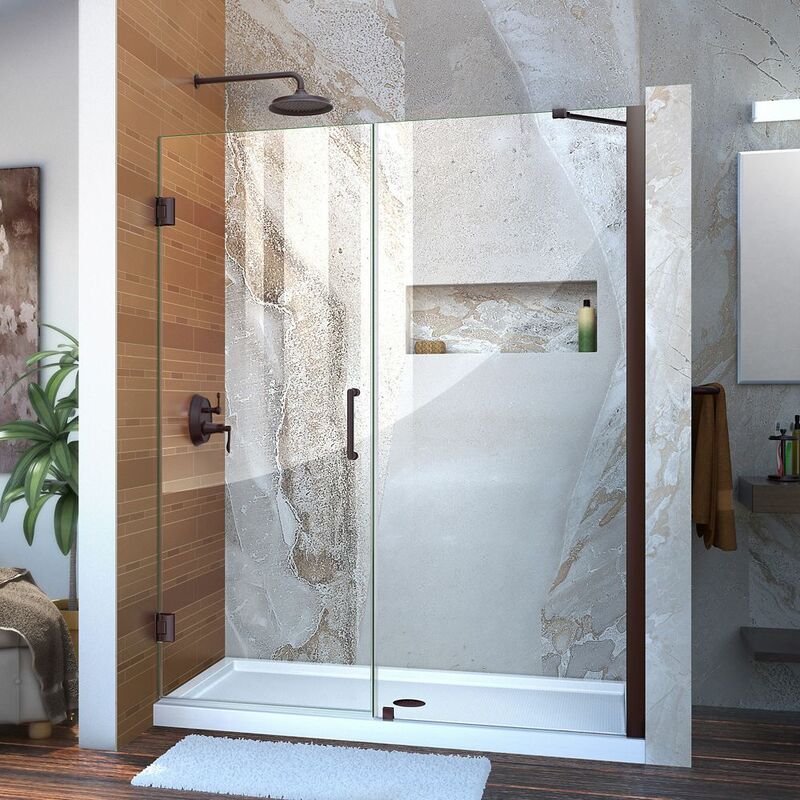 Unidoor 58-inch to 59-inch x 72-inch Semi-Framed Hinged Shower Door in Oil Rubbed Bronze is rated 4.5 out of 5 by 14. Rated 4 out of 5 by Scott from Fairly straightforward. Handle was cross threaded from the factory. ... Fairly straightforward. Handle was cross threaded from the factory. Rated 5 out of 5 by Lisa from We had a professional install the new door. It took... We had a professional install the new door. It took him about 2 hours. It looks beautiful! Rated 5 out of 5 by DIY4us from We love how nice the doors look and how sturdy... We love how nice the doors look and how sturdy the system is. Over all we are very satisfied. Rated 5 out of 5 by Gloria and George from Perfect choice for our new Shower!!! My wife and I demolition of our forty year old tub/ shower and we retrofited a new Shower with three walls. The DreamLine Unidoor style B was an OUTSTANDING finishing touch. We did the whole project ourselves and the Dreamline instructions were easy to follow. Can be done will good mechanical ability. Had a small problem with the Hinges grinding when opening and closing the door. A little WD40 did the trick and two months later all is good!! Rated 4 out of 5 by HomeDepotCustomer from Pivot door 58-59 x 72 Great product and easy to install. Just will be a good idea add a 0.5 or so of touch up paint. Rated 5 out of 5 by Lucylee from This shower door was just as good as a custom made one from a glass company. It made my bathroom... This shower door was just as good as a custom made one from a glass company. It made my bathroom. The glass is thick. There is nothing I dislike about it. Rated 5 out of 5 by mcapenos from Nice quality door! Very heavy, but I guess glass is. Be careful handling and installing or have somebody do it for you but you'll be happy either way.